Forest officials of Manas National Park have arrested four wildlife poachers on Thursday morning. 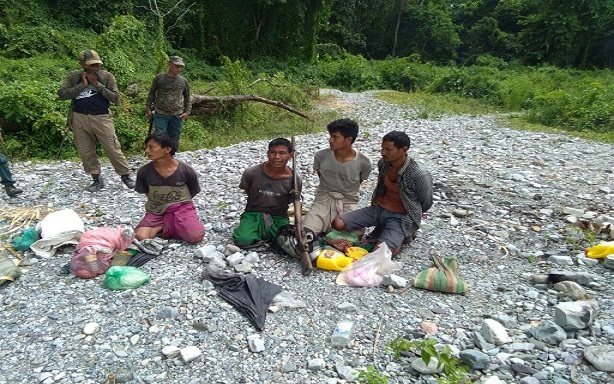 Acting on a tip off, a team of forest officials led by Deputy Conservator of Forest of Chirang R K Brahma launched an operation along with the 15 SSB battalion at the Kuklung range on Thursday morning.. The four arrested poachers have been identified as Tepu Daimari (35), Tarala Boro (25), Temon Basumatary (27) and Anilal Musahary (40). Handmade gun, gun powder, bicycle bearing balls and torch were recovered from the possession of the poachers.